Nose: Lots of fresh malt on the nose of this one, along with apples – both red and green, some pears, a light touch of both vanilla and honey, and the faintest waft of some floral notes. Palate: The palate pretty much continues on from the nose – everything that is present is in the nose makes an appearance in the palate, with perhaps a bit more fresh malt, a light touch of sea-breeze saltiness (very light), a touch of nutmeg, and the slightest sense of something nutty such as slivered almonds. There’s also a bit of oak spice right at the back. Mouthfeel: This is thick and creamy – not quite as gripping as the Islay Barley 2006, but still quite thick. Just brilliant. A little bit oily, but just a touch. A bit of warmth is present from its 46% ABV bottling, but is quite drinkable despite this. Finish: Quite long, some salty vanilla, more apples and pears, and some of the malt is still hanging around. There’s the slightest bit of warmth also hanging around in my gums and on my tongue – but just the slightest amount. Say what you will about the blinding turquoise bottle and packaging – people either love it or hate it (I actually quite like it – it livens the whisky cabinet up somewhat), but I’ve certainly got nothing but good things to say about the contents inside! This whisky is extremely smooth and well balanced, with the various flavours sitting together quite well and not fighting each other in any way. This whisky has been bottled at 46%, giving it a bit more backbone than many entry-level whiskies that are around; yet is surprisingly drinkable without any water or ice being added. As is the Bruichladdich way, it is also non-chill filtered, and has no added colouring. 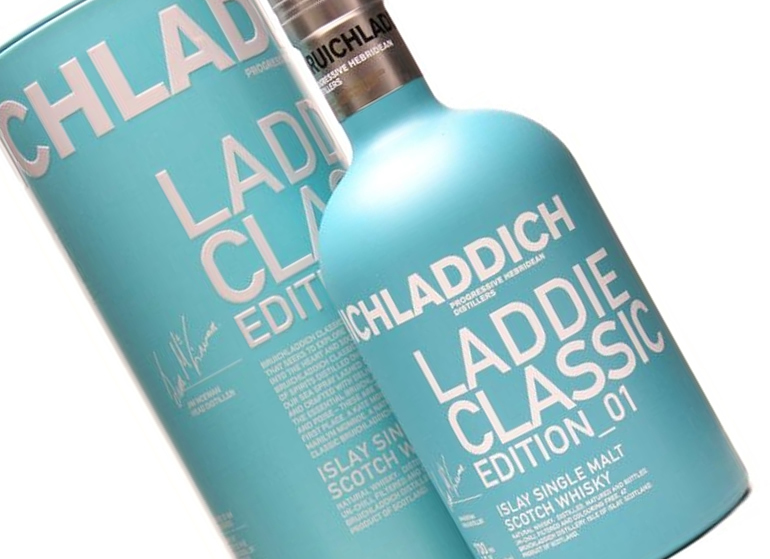 After the massive success of The Laddie Ten, which was a victim of its own success – with Bruichladdich not wanting to ever inadvertently diminish the reputation of the whisky that ensured the viability of the distillery, and thus have left it as a ‘single vintage’ – the Classic Laddie was released as a statement as to the essence of Bruichladdich whisky; this spirit is the basis for all others from the distillery – from the monumental variety of different casks and finishes, through to the Laddie Sixteen, Laddie Twenty Two, and Islay Barley bottlings, and on to the Black Art, Port Charlotte and Octomore sub-brands. I’m obviously not the only one that thinks highly of this whisky, as since the 1st release Bruichladdich have not stopped pumping it out – although they rearrange the name every now and then, which I’m sure they have a reason for doing – though I haven’t got a clue what that would be. The Classic Laddie in its distinctive bottle will long be a staple in my whisky cupboard. Unusually for a whisky from Islay – indisputably the capital of peated whiskies – The Classic Laddie, like nearly all “Bruichladdich” branded whiskies is unpeated. That’s not to say that Bruichladdich doesn’t produce peated whisky though – their Port Charlotte brand is entirely made up of heavily peated whiskies, and their Octomore brand is all super heavily peated – with some expressions going up to 258 phenol parts per million. Built in 1881 when puffer-supplied coal was available as an alternative fuel to local peat, it is likely that Bruichladdich was specifically designed to produce the purest unpeated spirit possible. The great Alfred Barnard supports this view with a tantalising clue – the Laddie is the only distillery on Islay that he does not describe as drying its malt using peat in his fascinating exploration of the island’s distilleries in 1885. Sadly, none of that 19th century spirit survives, but the original Victorian machinery has allowed an unparalleled legacy of craft distilling to trickle down through the generations of men who make this sophisticated Islay dram. We salute them, not with bland homogeneity, but with a glorious palette of expressions that celebrate the range of possibilities of this, the world’s greatest spirit. Whilst The Classic Laddie doesn’t quite match the brilliance that was The Laddie Ten, nor quite have the richness of flavour that is Bruichladdich’s Islay Barley line, it is still an exceptional whisky, and one I highly recommend you try if you haven’t already.